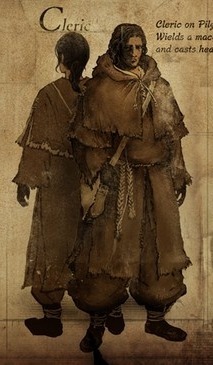 The Cleric is a member of the Way of White founded by Allfather Lloyd, on a pilgrimage to the land of the gods, Lordran, as a test of faith when dissatisfied by the church teachings. It's very likely for the cleric to have actually come from Thorolund, the kingdom where the church created by Allfather Lloyd is established. The cleric's combat style is based on dealing heavy blows with a mace combined with the use of a Canvas Talisman for healing miracles, but lacks protection, being the East-West shield the only real defense. The pilgrimage holy robes are specialised in repelling rain and cold, keeping the body warm. A corpse can be found in The Catacombs containing Cleric's set (along with the head piece) on a ledge, below the broken bridge. Given Patches' known hatred for clerics and the him operating traps in the Catacombs, it may be that he had a part in his death. The Palaiologan emperors used the double-headed eagle as a symbol of the senior members of the imperial family. Use of the double-headed eagle in Hittite imagery has been interpreted as "royal insignia". The double-headed Reichsadler (Imperial Eagle) was in the coats of arms of many German cities and aristocratic families in the early modern period. It continued to be used in the family coat of arms of the House of Holstein-Gottorp (1762-1917)) of Austria-Hungary (the House of Habsburg). After the dissolution of the Holy Roman Empire in 1806, the double-headed eagle was retained by the Austrian Empire, and served also as the coat of arms of the German Confederation. This probably inspired the theocratic society of Thorolund and how the White Way Church influences Lordran (and possibly more kingdoms). Allfather Lloyd, Gwyn's uncle, persecuted the undead and pillaged them for their humanity to kindle the bonfires with Gwyn's permission. 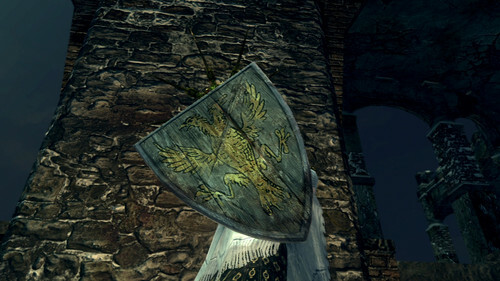 Furthermore, the yellow color can be connected with the light of the Age of Fire, the light of the gods of Anor Londo. Decorated with the ancient symbol of a double-headed eagle, painted yellow. Medium for casting miracles of the Gods. Canvas Talisman is for clerics on pilgrimage. Donned by the men of the cloth. Though plain to the eye, its hardy fabric repels rain and keeps the body warm. Those dissatisfied with church teachings must test their faith by going on a spiritual journey. Such is the ritual of self-purification of the Way of the White. Distinctive hat worn only by Way of White priests in Thorolund. It is simply meant to show their position within the hierarchy. It holds almost no meaning in the land of Lordran.